LiveGreen International Incorporated, a proud member of the Israel Chamber of Commerce of the Philippines, engages in the production, processing, distribution, and retail of organic farm produce. It has been in operation since 2009, and its products, are available in leading supermarkets and stores in Metro Manila and nearby provinces in the north under the brand name Organicus. It is also in the business of developing organic farms, training of professional organic growers, qualified farm technicians and personnel as well as production of certified organic inputs & implements and non-perishable items. Working together with groups of farmers, cooperatives, traders, agri suppliers and suppliers of packaging material, service providers, and financial institutions, Livegreen is linked as a chain, merged into one to deliver their products swiftly right where you want it to be. LiveGreen sells its products to consumers and institutional buyers through its website and catalog. The delivery charges are free with purchases above a certain amount. Their selection includes raw vegetables, ready to eat & drink products, processed and superfoods, as well as gift packs. 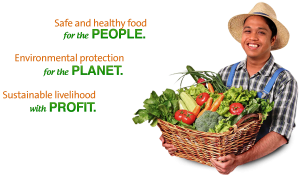 Livegreen continues to act as a bridge between consumers and farmers through its Community Supported Organic Agriculture. Through it, consumers can commit support to the farmers and in return, are guaranteed of weekly supply of organic vegetables, and at the same time help farmers sustain their livelihood. LiveGreen has two brands under its auspices; namely, Organicus and Green Goodness. Green Goodness is the brand that caters to institutional buyers and individual consumers especially for processed products, who call or order through their online store. Organicus is their brand for fresh products and is found in leading supermarkets in Metro Manila. For more information on LiveGreen and how to order, call (03) 412 0169. Or visit their website at http://livegreen.ph. You may also get in touch with them via their Facebook and Twitter accounts.